Cost Savings. Cost-effective technology with up-front pricing and low monthly costs. User-Friendly Technology. Just the right solution for your business: intuitive, easily understood, with expert training and rapid implementation. Reliable Customer Service. No matter where the problem is, we take care of it with fast, friendly and knowledgeable phone consultations, service and repair. And we offer 24/7 for emergency repair service. Quality Equipment. Name-brand equipment, reliable technology, excellent warranties. Industry Leaders. 3zVC partners with Star2Star, a well known, industry-leading, and fast-growing company. Disaster Recovery. Built into your solution architecture, ensuring complete business continuity. StarSystem – Blended architecture puts resources where they make the most sense. 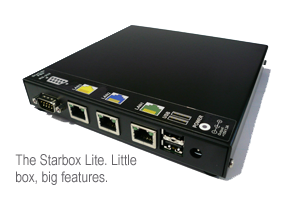 StarBox – Our super-reliable, solid-state, on-premise voice appliance. It provides all the features of an IP PBX system, as well as vital traffic shaping, quality monitoring and management functions. Phones & Accessories – We offer a broad selection of desktop IP phones from Cisco, Polycom, and Yealink, as well as cordless phones from Panasonic. You can mix and match phones from all four manufacturers on the same Star2Star system. Star2Star Software – The Star2Star Application Framework is a powerful, robust application platform. It provides fast, efficient distribution of cloud-based software and data. The framework allows Star2Star to deliver application software—and the application’s associated data—to any PC or Mac, anywhere there’s an Internet connection. StarPhone for iPhone – Star2Star’s StarPhone for iPhone combines a full-featured IP telephone application with advanced presence and voicemail tools. The result is an easy-to-use softphone that allows users to place and receive calls using your company’s Star2Star telephone system—wherever you are. StarFax Personal – Reliable, cloud-based desktop faxing to your Star2Star system. StarFax Personal us­ers can send and receive high-quality faxes to and from their desktop or laptop computers, without making a printed copy, and without needing a fax machine. ©Copyright 2012 3zVC All Rights Reserved. Design by Seebach Creative Services.